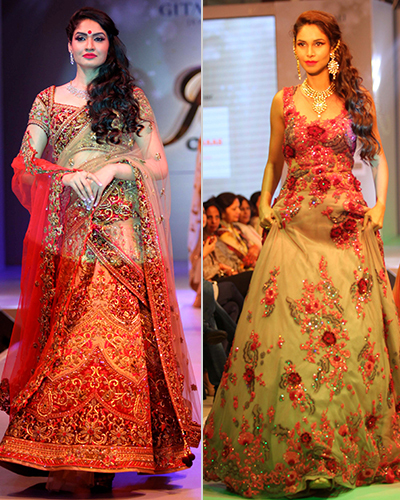 Chandigarh recently witnessed a unique couture show high on fashion, glamour & royalty. Cleopatra chain of beauty & makeovers showcased bridal couture trends and forecast for 2016. Cleopatra also unleashed exquisite line of trendy looks that enthusiastically celebrated the sophistication and ecstasy of the Royal time. A fusion of elaborate hair dos, meticulous makeovers, rich looks and refined luxury were showcased. The lavish embellishments added up to the exquisiteness of appearance. The show was reminiscent of the bygone era of Royal Raj. An old world charm put into today’s new world. Richa Aggarwal, beauty expert & owner of Cleopatra said “ for a beauty statement as stunning and strong we have lent our fine creativity to form an incredible structured line of looks that is wrapped in the monarchy of fantasy and desire. All the looks presented by Cleopatra were vintage in their comprehension, yet very modern in appeal. Richa Aggarwal further added, “We have used modern and unconventional line of shades in makeup and accentuated the looks further through structured hair dos. We have displayed the looks with inventive use of a colour palette that is minimal yet vibrant, with moon down gray, absolute black, ivory and reminiscent red. Anmol Sandhu Rai Mrs World 2015, Amrita Patki Miss India and Aparajita Aman Miss World runner up along with beautiful Models in Flowing gowns, modern silhouettes, and stylish detailing strutted down the runway with fine defined royal and dramatic palette of rich plums, deep reds and feminine pinks. On the occasion Richa Aggarwal and makeover expert Harveen effortlessly blended historical opulence with hint of contemporary – day chic looks. Richa’s work epitomized elegance during the grand show. Makeovers were blend of two innovative traditions with a inimitable approach that brought out a synthesis of Indo western look and fancy that is lavish and charming. Evening was high on royalty and glamour. Guests at the event relished the la carte food and beverages and were seen enthusiastically talking about beautiful makeovers.